But a few weeks ago I was having lunch with friends and they wanted me to go by a needlepoint shop in the area to see some finishing they were picking up. So off we went. 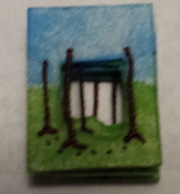 While I was there, it was mentioned that I had stitched a 1st Communion piece and I showed the picture in my phone. I also mentioned I had a granddaughter graduating from a local high school. One of the owners mentioned that they paint the cypher for that school in two styles…Oh pleaseeeeee let me look. And yes here was what had been mulling around in my head… I asked if they could have this painted on 8 x 8 inch canvas and leave off the circle outline…sure thing. They took my order and then put the original canvas with it to send it to the painters. I thought this was strange; wouldn’t the artist have a master? So know I am going to get a canvas with major part of the designing already completed (I will not have to re-invent the wheel) and then I can personalize it for my Granddaughter. And you know what, I’m sure she will appreciate this even more knowing that we helped someone less fortunate in the process of making her special memory. I love my local shops, they both carry a different variety of things, the help is good, stitchers are friendly and they both have outreach programs. Do visit your local shops often. 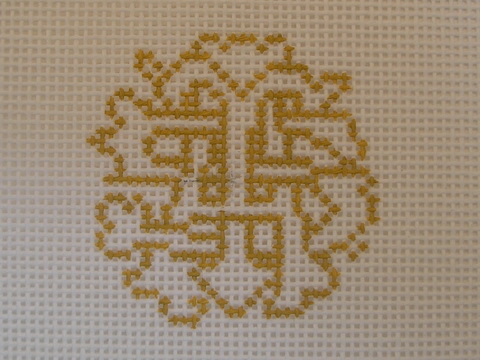 I’m thinking about beading the cypher; could use the three beads from Mr & Mrs. I think I might discuss this with the graduate, maybe she would like it finished with her tassel. Ummm—that would give me more time too. I’m liking this better all the time. I will keep you posted on the progress of my graduation gift. Thank you for stopping by, I hope you have time to stitch today. 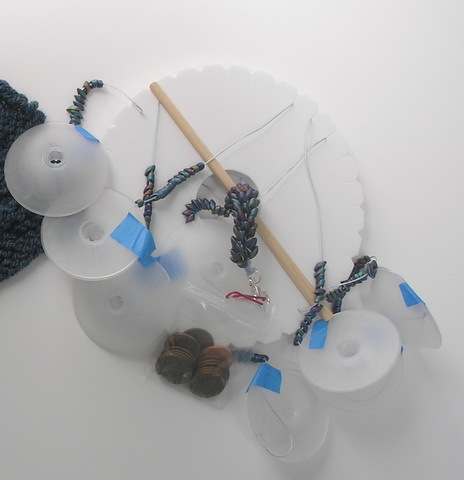 After I finished Mr & Mrs I took a couple weeks off and just did knitting or Kumihimo…anything without beads. But one day I was looking through my stash and came across this piece. I have always loved it, it is an adaptation of a Charlie Harper print and I love Charlie Harper prints. Ann-Strite Kurz (https://www.annstritekurz.com/ ) has always been one of my favorite teachers. If you read Ann’s resume it is very impressive…she is one of those teachers who has forgotten more than some of us will ever learn. I own many of her books and I follow her article every month, Using Common Stitches in Uncommon Ways, in Needlepoint Now (https://www.needlepointnow.com/). Our guild had her teach an applique class one time and I loved it; I still use the techniques I learned in this class. I love her work but was never able to get into one of her classes at ANG national seminars…My luck of the draw never seemed to work and most of her classes seemed to go to lottery. 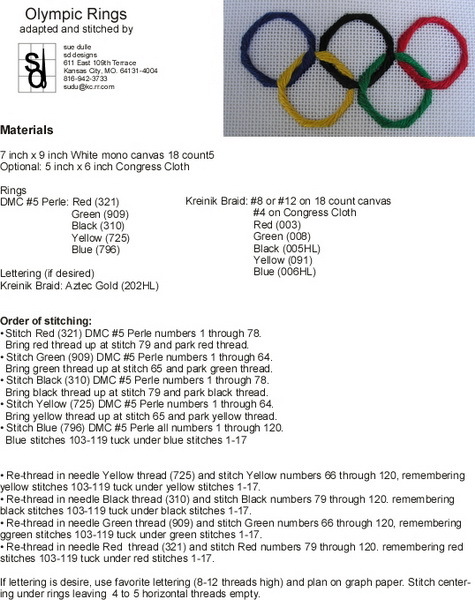 Somewhere along my stitching path I had acquired one of Ann’s teaching pieces, Br-r-r-r-rdbath, (probably a stash sale or someone gave this to me). It has been one of my favorite pieces for a long time and had been waiting it’s turn in my stash, so I pulled it out…time to do an Ann piece. Ann’s books are so well written that I knew her instructions would be no less and they were everything I expected them to be…excellent. Ann’s instructions and diagrams are some of the best. I had no idea what I had gotten myself into…I was looking for a fun easy stitch but this was going to be a learning piece. But you know what I have always loved this piece so it became my at home project. First you stitch the Smyrna outlines (dotted lines in picture)…then you started the border designs. The borders (A & B in picture) are truly a lesson in “Using Common Stitches in Uncommon Ways”! 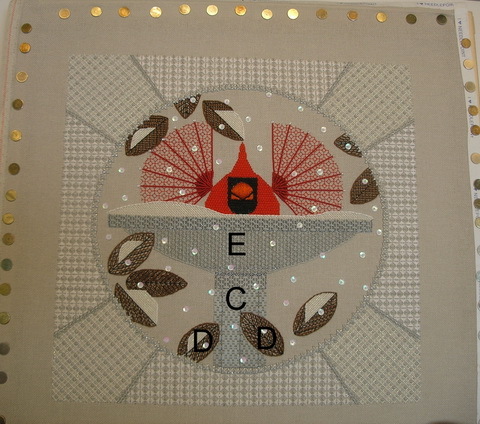 If I remember correctly, there were at least four steps to each border and then BEADING. Remember I said I was trying to avoid another beading project? Well at least you waited until the design was completed to add beading maybe I would recover from the Mr & Mrs beading. Then I started the design part of the piece and every area was a review of a previously learned skill or an adaptation Ann has created to enhance this design (area C the birdbath.) I loved stitching this piece…okay maybe love is a strong word but I liked the challenge it presented. 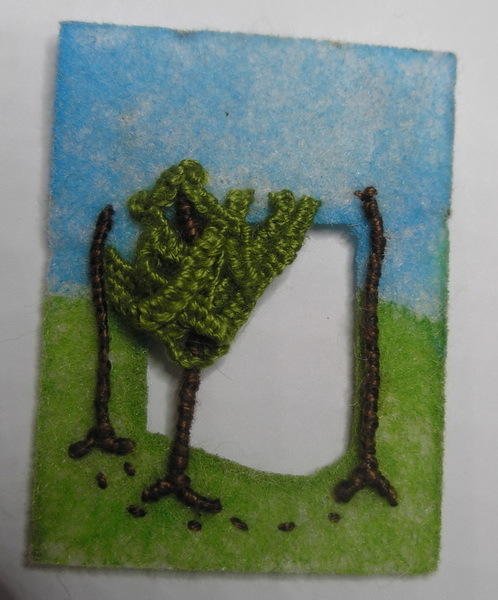 The leaves (D in picture) became a challenge for me and then I decided, this was my piece and I was stitching it for me and so if the leaves were giving me a fit I needed to adapt and overcome. 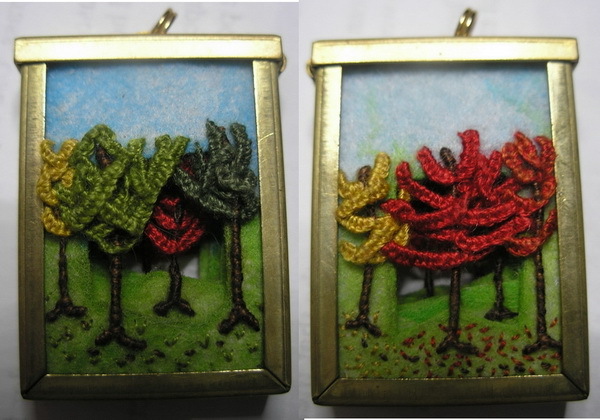 The leaves became my change to the piece; I had stitched the first two (D in picture) as instructed and was having a devil of a time, so the rest of the leaves are my adaptation of the instructions. This was my fun relaxing piece and I was keeping it that way. I’m the only one (and now you too) that notices that the leaves are a bit different …but then aren’t all leaves in nature different?! 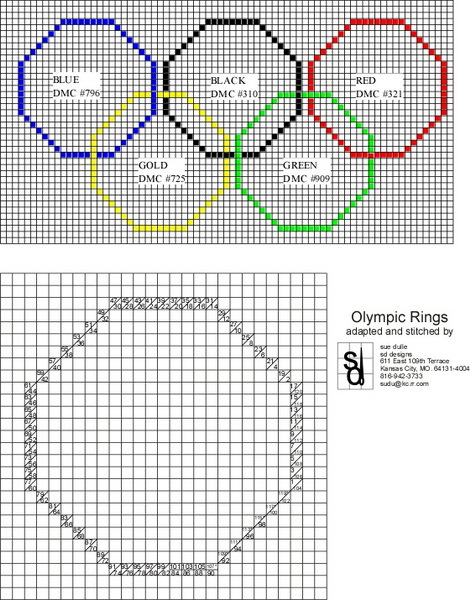 Becky Hogg; Blackwork RSN Essential Sitch Guide. 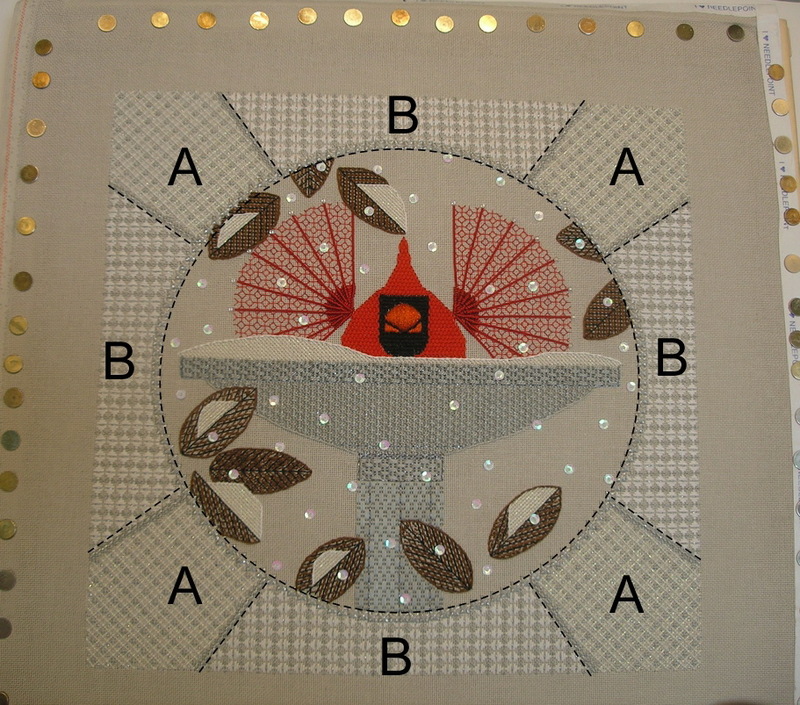 By the time this piece was completed and I was ready to start the beading, I had decided that I would add the sequins (you use a bead here to attach the sequins) but the border was going to be sans beading. I liked the look and I was not into that much beading again. 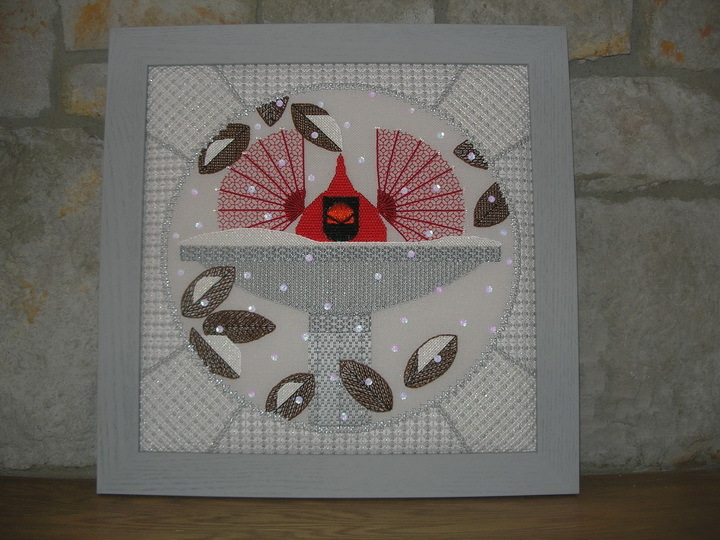 So here is another project under my belt and it is also in a ready-made frame. I really do like framing pieces when I can do it myself, and then they don’t end up in my to finish later pile. So another project is completed but I still have more to catch up and then maybe by summer I will be back to finishing projects or sewing. BTW, if you really love Charlie Harper designs, the Meredith Collection (http://themeredithcollection.com/) has them in needlepoint; you can see them at The Meredith Collection: http://themeredithcollection.com/collection/charley-harper/needlepoint. When I get caught up on some of my stash, I will add to my collection here. Last week I was suffering from creative dry spell…it usually hits when I am overwhelmed, just finished a project or am putting off something. I was/am suffering from all the above. Look ahead to projects you must finish. Okay, I am procrastinating on this one. Just keep active. That’s what I’m doing. 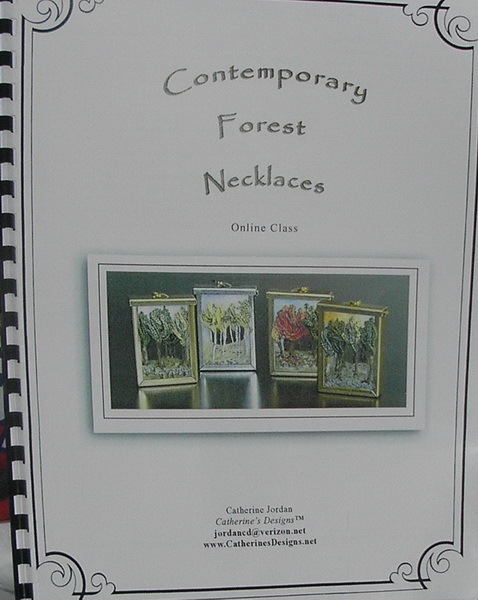 So I decided to work on my Contemporary Forrest Necklaces by Catherine Jordan. I have always loved this piece and when it was offered online several years ago (2014 I think) I enrolled. I don’t know whether I got overwhelmed by the class or it was a time constraint issue but I only got as far as painting the canvas/felt and cutting it out. 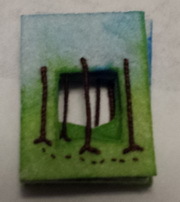 I think I may have even tried putting some tree trunks in because one of the felts has marks that look like I may have taken a needle through it. 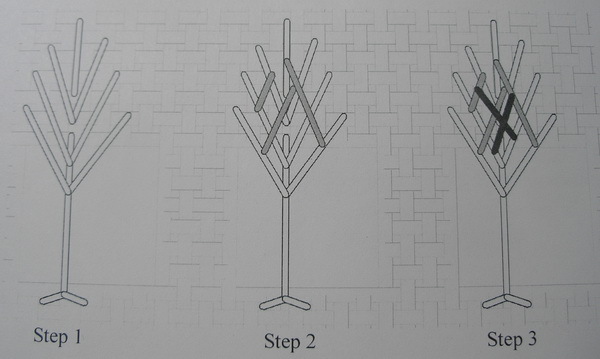 I started the tree trunks; they are wrapped thread technique using DMC Floss. Pretty simple but I still took them out once because I did not like them and when I re-stitched the trunks could not tell much difference so I thought maybe I was being overly critical of myself or maybe just trying to put off the next step. I decided to go with my tree trunks and see where I ended up. The tree leaves were a challenge. Not the method, I understood that. 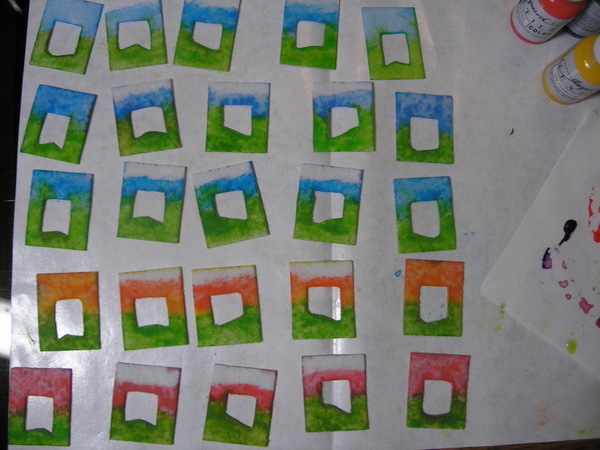 Where to place them, where to attach them and how many was the challenge. 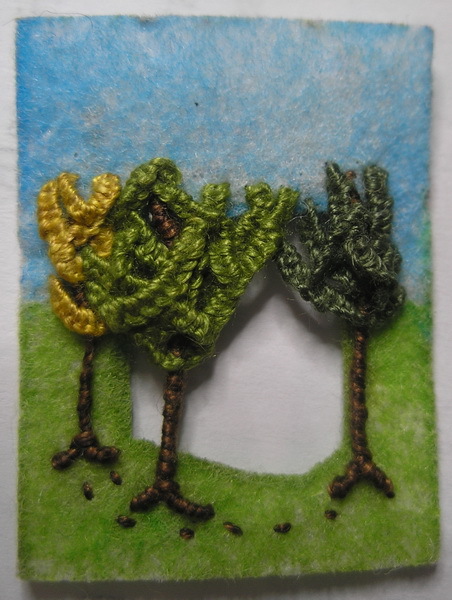 I decided to follow Catherine Jordan’s instructions to the letter and so the first tree on each side of the canvas is stitched according to her directions; Buttonhole stitch using more DMC Floss. By the time I got to Side B, I may have gotten carried away doing the red one but by then I had done the first set of trees and was feeling both confident and overwhelmed at the same time. Let me give you insight into my thought process… When I revisited this UFO I had decided I could make several sets of these to represent the seasons…In my mind I would just whip them out one after another. In reality, the trunks for one canvas took me the better part of two days and the leaves for one tree another half day. By the time I had finished the one felt with leaves, I knew that four sets of canvas was not going to happen. This was supposed to be a fun project to get my creative juices flowing and while it was doing just that, I did not want it to turn into a project that I felt compelled to complete all four seasons. So on the Side B felts, that could also be used as the front, I stitched the leaves with an autumn color pallet. I joined all the canvas together and placed them in the frame, and fluffed the leaves. Now I have two completed projects: Side A and Side B. I love the piece and now have my very own. I also think I want to bead a chain to use with this, but for now a simple gold chain will work…Just goes to show you, once the creative genes get to flowing…one thing leads to another. I have saved the felts, threads and instructions for another day and maybe I will revisit or find something new to try with the felt…never know. I think I can safely say I have suffered from “Creative Dry Spells” in all forms of my artistic endeavors. It is like being in a depressed mood; you know it will pass but it does not make it any the less painful. They are not fun, nor can you talk yourself out of them; the best thing to do is ignore them for a day or two and then try to work thru them or just do something else like cleaning (ugh) or cooking. Cleaning should convince you to be creative real quick and cooking can be creative also yummy if you bake or make desserts. Sometimes any of these are easier said than done depending on how “dry” you are feeling. Sometimes spending some “me time” with a cuppa and your favorite needlework books and/or magazines can help. I love my books and looking through them may give you an idea of something to stitch, a technique to try or maybe you will just relax and look at the pictures. You are at least spending time with other creative people and this is good. They may remind you of a canvas you have at home that you were really dying to stitch just a few weeks ago. They may show you a new technique they are working on, a new stitch, a new thread, or maybe just give you a smile that will brighten your day. And if you are lucky enough to have more than one shop in your area you have that many more chances to get those creative juices flowing…whatever it takes to spark those fingers. And if you are really lucky, maybe you can sit and visit with others. You don’t have to be stitching something, you can just visit. I visit a group(s) and not everyone is stitching needlepoint, some are knitting, some are stash enhancing, and others have just come by to visit. Bend the thread over the needle and then thread that bend through the eye of the needle. None of these are wrong, None is better than another…it is what works for you. But if some needle artist is having trouble threading a needle just being around other needle artists may give her the idea she needs to thread her needle. I know that is pretty simplistic but you get the idea. If you don’t want to tempt you credit card, watch a love flick, visit an art gallery, visit a park, just take a walk. Anything will do to keep you from sitting and brooding about the “dry spell”. I have two artist friends that seem to ward off dry spells by drawing every day; they have notebooks of their works. I am not that disciplined and that’s probably why they make a living at their art and my art just keeps my sanity. One of my friends tries to go out and about every day to see inspiration. He will draw and paint in his notebook people and places around him. Recently at an art fair, I ask him if I could see his journal and he shared it with me. He was in a mall at an art fair, yet found the time to capture the other artists around him. Each entry has the day and date of the week (he told me it was like his day planner). Not only was there an image of his fellow artists but a small drawing of the type of art they were showing. WOW! I spent several minutes looking through his diary and it was such a privilege; I felt like he not only trusted me very much. He had let me see into his soul; it really was a special moment. I did not read his thoughts but just looking at the pictures he had drawn. I left his booth maybe not inspired but feeling sooooo uplifted. My other artist friend is a former art professor and he lives close to his former university. You can visit him anytime he is in town and he will listen to you and then in his own magical way give you some thoughts to ponder. He never gives you “his answer” because then you would not be working through your problem. Once a week, when he is in town, he holds “tea time”; an open date to just visit with others of like mind, have tea and discuss whatever comes up, such an enlightening way to give so much insight into so many things. It is no wonder all he asks is for you to RSVP your attendance; these events are attended by friends, former students and students who have heard about him through their professors. And even though it may be a crowded place on occasion, you always come away feeling inspired and more than that hopeful, optimistic. So, I think I will be off to look at my stash and maybe it will trigger something. I hope you are not having a creative dry spell but if you are, join me by going through your stash and let’s see what happens. I really hope you can just go stitch and have fun. While I am getting my thoughts together for blogging I am also in charge of our local guild stash sale. I like to think of it as we are sharing our stash…I’m sure some of the canvases will come back to visit us at another stash sale down the road…wouldn’t it be funny if the original owner re-purchased it 😉 . We have these stash sales to fund outreach programs. A couple years ago we funded an exhibit to bring in new members. These funds will go toward another exhibit or possible paying to have a website built for our guild. Another method to store large canvases is to roll them; canvas before it is painted comes in large rolls. I think I would occasionally unroll and re-roll from the opposite end so one end does not become a tight roll or even crimped. So my message for today is: Please treat your canvases with TLC. Don’t fold or stuff them in a bag for a later time. Canvases, especially painted canvases are expensive, so please treat them carefully. And I won’t get started on whether you should stitch your canvas on stretcher bars or not…that’s a whole other blog. 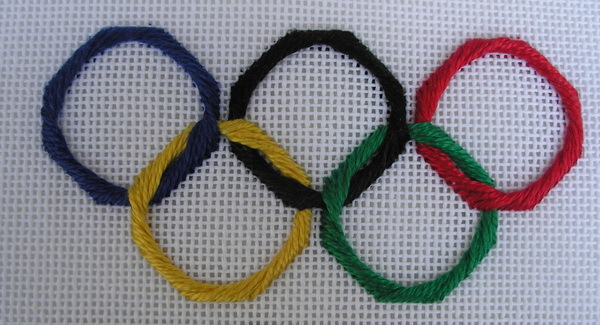 While watching the Olympics this week-end I remember I always stitch the Olympics rings for someone during the Olympics…guess I’ll stitch a couple of these for my two great grandchildren. I have a chart for this. I will post here but if you can’t get a good copy send me an email and I will send you the PDF files. I can’t sell the design but I can give it away. The reason you haven’t heard from me is I’ve done it again…I’m expanding my needlearts learning. Last week I took a knitting class, kumihimo with beads class, a beading class, made another temari ball, wrapped 3-4 more to stitch in the next couple weeks, and yes I needlepointed too. I know I should concentrate on one project at a time but I love them all and can’t pick just one…so I’m just going to have to figure a way to sleep less, cook less (love these too), general household duties (don’t like these so much) or maybe I could just clone myself. And I am sorry but I think my blog suffers the most. I really am going to have to get in a habit of stopping here. Last week in a magazine I finally had time to read there was an article on how to have a successful blog and I guess I’m never going to have a successful blog by their standards. I am supposed to find a niche and stick to it…and we all know that isn’t going to happen. I have too many things I want to learn and do. Then I looked at the name I gave my blog nine years ago “sudukc’s needleart & other musings… A place to see what I am doing or not doing”; I must have known then that this is an eclectic place. 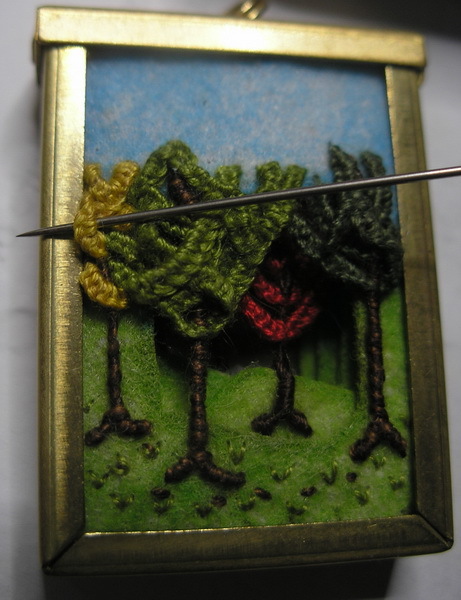 It is mostly about needlepoint because that is my primary love but it is also about any kind of needle art because they are all fascinating to me. So, thank you for finding my musings interesting even if they are all over the place and sporadic at best. I used to think I knew my limitations, and I do know that I love quilts but I am never going to make my 13 quilts…For those of you who don’t know; history or folk lore says that before a girl got married she had to make 12 quilts, the 13th quilt was made and quilted by friends and family when she was about to get married. And anyway, I’m already married, too late. But I know too that I am not a large quilt maker; I tried it, and even though I love them and they are beautiful but it is not me. I like smaller projects and there are plenty of them for me to try. Last week I was beading at Florilegium with Gretchen and I said I wish I were as creative as she is. Gretchen tried to convince me I am and just need “to do”… After I got home I really thought about this and I think I am creative…just maybe spread too thin. No matter what project I pick up I can think of 4 or 5 other things I want to do in the technique I am working at the time. I have decided to write them in my Stash Idea book, or if they are in another book or magazine to mark and keep for after I catch up. It’s like stash…only I’m not buy the canvas and thread (well I still am buying needlepoint canvas and threads but that’s a paragraph or two down.) I’m going to think of this as stash ideas and when I want a project I will just look at my Stash Idea book, purchase the supplies and go for it. I probably could check around the stash already purchased for some supplies, but we all know I’m going to be short something. 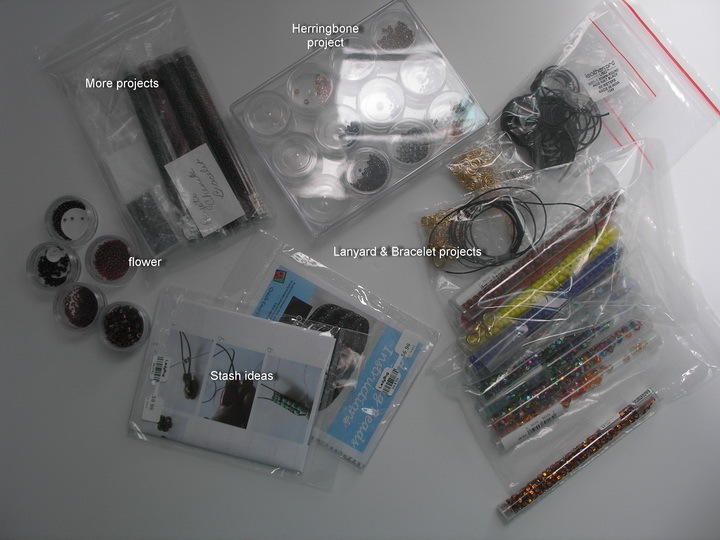 These are the beading projects I have in the works…several fobs, a herringbone learning piece, several other projects to start…I also have marked my books with more stash ideas…I do believe my bead stash is growing. Now I am combining my kumihimo with beading and starting that too. 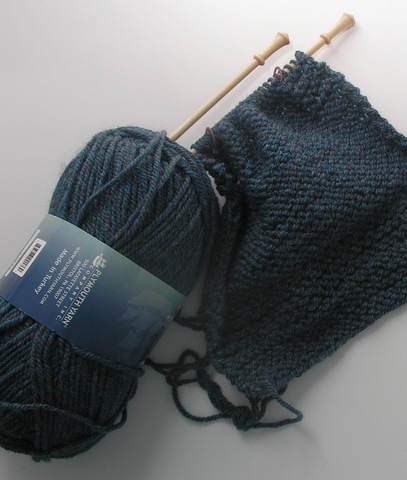 And I am bound and determined to learn to knit…no Peruvian sweaters in my future but I do want to learn how to knit. I can crochet and have tried knitting several times before but I never seem to get the hang of it. I am bound and determined to learn this; it will not get the best of me. And I know practice is the best teacher so I try to do 5 minutes every day. I don’t go back to classes for another week, but I hope then we start a project and I have a goal in site. Like I said last post, I belong to two Temari discussion groups online and they are having stitch-a-longs. And since I have been a lurker for these past few years I have decided to try and participate. I’ve done two so far and have two more in the works. 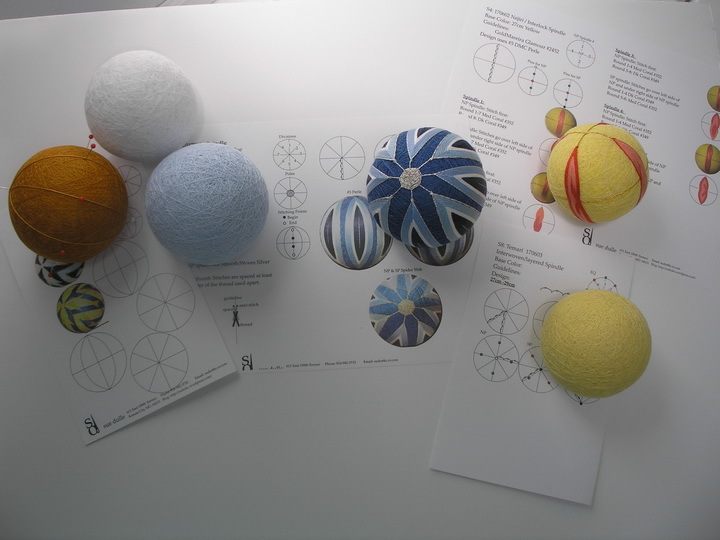 I also try to keep an info sheet on every Temari I make (another to do), never know I might want to make another. I think it is difficult to write exact instructions for Temari because each ball is a unique size. I can only approximate the size of the balls I make and I like them about 30 cm, give or take and larger. I find for me the larger balls are easier to work on. And I have been needlepointing too. I have a secret project in the works…I’ll show it to you soon. It is a gift and I want it to be a surprise. I am finished stitching and just have to get it finished and given then I’ll share. I am also working on a small take-a-long project but just haven’t taken pictures. This project I only stitch on when I go to a guild stitch-in, stitching with friends or to my weekly stitch-in at local shop. I also am gathering stuff for another nest project. Nest projects seldom leave home; they are larger projects and require a stand and light. You know I was just thinking, if I ever win the lottery (guess I should buy a ticket) I’m going to have a studio and call it Stash Studio or Creative Corner. I am going to have all kinds of my favorite stuff. I’d really like to live above the studio and whenever I want (day or night) just go down and play. When the lights were on, my friends or anyone could drop by to stitch too. I would never want for any stash, it would just always be there…okay so this is a dream but wouldn’t that be great. I hope you all are staying cool this summer. To my Canadian friends, “Happy Canada Day” yesterday and to my USA friends have a safe and happy 4th of July. I’m off to redo my herringbone sampler, then I think I may tackle another beading project or two and then I’ll stitch and watch a movie this evening. 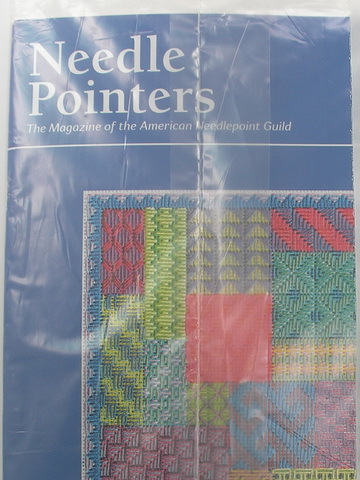 And oh yes, NeedlePointers arrived today ; so I need to stop and look at this too.